After learning that there may be three more students in my second weekly painting class tomorrow night, I immediately bought two more tables for the studio. So that takes me to a total of six students, which is enough to fill the room. We may be a tad cozy, but it will work. These will be spread out a few more feet by class time. Right behind the ones on the far side are some boxes, which will be moved by then. That will open up more room in the center, between the tables, for us to maneuver. I have decided to limit the works that I offer in my Etsy shop for paintings. I’ve removed everything except my “Echoes” series and feel so much better about how it looks overall. But since I have only 17 paintings in that series, I guess I have to get painting! Looking good Martha! 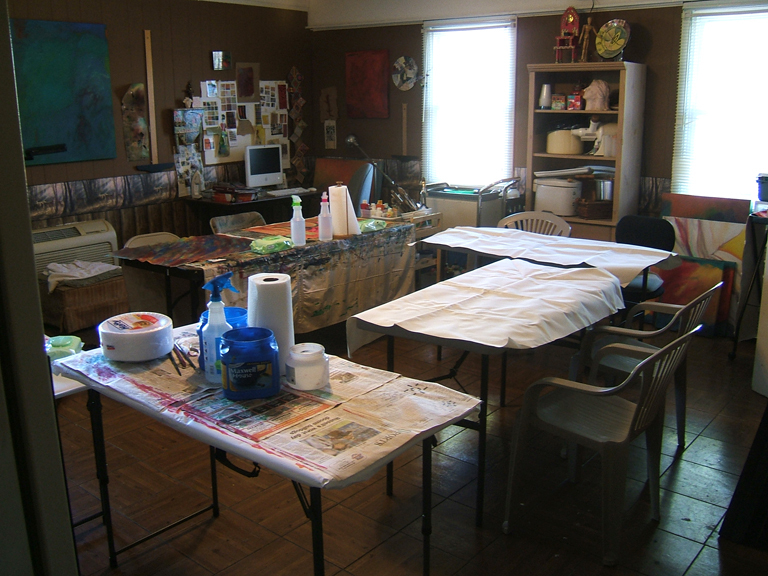 Both the studio space and the Etsy gallery seems fresh and ready for new energy. Best of luck. Thanks, Terrill! I appreciate and value your feedback on that. very nice…..obviously they want want you have and what a good thing for them that you have agreed to teach. Everyone benefits….yeh! I’m finding Etsy tedious at the moment. I really don’t know what to do there. I do sell, but it’s such hard work…….. if you play the system, that is. Life’s too short and I have so much I want to create! Just no…. time….. Have fun tonight. Myfanwy, I hear you! I have the same dilemma, but haven’t decided to give up on it yet. But it’s true, you do have to make a certain time commitment or it just sits there and does nothing. We’ll see what the rest of 2013 brings. I’m not sure if I’m more impressed by your commotent to teaching or your success at organizing! Everything looks great. It will be a good environment for learning. Annette, I wouldn’t have believed it three months ago. The class just sort of happened so my only choice was to be ready! Not a bad way to operate. Teaching is such a wonderful thing for an artist. It challenges us and keeps us fresh. Your space looks nice, organized and inviting. Much success with your classes! Thanks Stephanie. You’re right about teaching. I always learn so much — sometimes about people as much as about art!